A young lawyer and Seattle native is gaining a foothold in the explosive world of eSports. It was a United Nations kind of crowd at Top Pot Donuts the other morning. Clusters of young Korean men in baseball hats. Four people breaking in and out of French as they ordered coffee. Two women murmuring in Italian as they puzzled over the Apple Fritters. And all of them wearing lanyards bearing a badge from something called The International, a tournament drawing some 12,000 people from around the world to Seattle’s KeyArena to watch teams of mostly men compete in the online game Dota 2. Every day for a week earlier this month fans crowded in to watch players compete for a $6 million grand prize. Blum, 27, is a young lawyer and Seattle native who is gaining a foothold in the explosive world of eSports, which is quickly becoming the most popular — and lucrative — entertainment industry in the world. According to technology research firm Gartner Inc., it is on track to generate $111 billion in revenue this year. Just two months ago, Blum and his colleague Matt Hooper left the firm of Foster Pepper to open IME (Interactive Media and Entertainment) Law. Blum’s focus is eSports teams and players: their contracts, endorsements and other sources of income, including online channels where subscribers pay to watch them practice. (Hooper still does film and television law). And Blum just signed on as in-house counsel at UNIKRN, the first gambling platform for eSports. It allows those in cities where online wagering is legal to bet on eSports tournaments like Dota 2 and League of Legends. (Bets are capped at $250 a game). 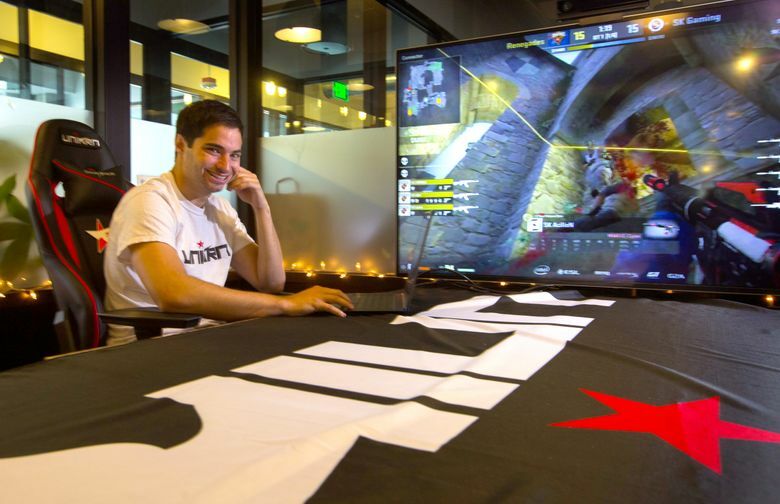 UNIKRN was started by Rahul Sood, who until last fall was the general manager of Microsoft Ventures. He launched the platform last April, and recently raised $7 million from investors like Mark Cuban, the owner of the NBA’s Dallas Mavericks. The eSports revolution may not have the high profile or mass appeal of football, baseball or soccer. But its numbers speak of its power and momentum. ESPN Magazine recently published a story titled: “Resistance is Futile: eSports is massive … and growing.” According to the piece, there are 28 million eSports fans in North America and Europe, and that number is growing by 21 percent a year. Some 205 million people watched or played eSports last year. If “eSports nation” were an actual nation, it would be the fifth largest in the world. More than half of those fans are employed full-time, 44 percent are parents and 38 percent are women. And they love to watch. This year’s International, held Aug. 8-15, drew 20 million viewers, ranking it fourth in viewership of sports events overall, behind the Super Bowl (112.2 million); League of Legends (27 million); and The Masters (25 million). It beat out the NBA Finals (15.5 million) and the World Series (13.8 million). The winning team, a five-man squad called Evil Geniuses, took home $6.6 million to split among them. Blum, the son of Seattle clothing fixture Butch Blum and his wife, Kay Smith-Blum, is your typical millennial: raised in a push-button world of video games, televisions, computers and smartphones. His parents put no pressure on Blum or his brothers to enter the family business. Twin brother Kyle works for the state Department of Natural Resources and brother Case, 29, is an architect. Even as a kid, though, he knew he wanted to be a lawyer. After graduating from law school at George Washington University in Washington, D.C., he started working at Foster Pepper, where, in a meeting, he was asked if he was interested in working in entertainment law connected to video games and eSports. He was, and started by researching and writing a forecast on the legal future of eSports. The article landed on a League of Legends subreddit and was on the front page for 24 hours. Almost immediately, players reached out to Blum for his services. He now has around 30 clients all over the world. The players do everything that professional athletes do: They wake up (later than most; around 10 a.m.), play a couple of hours of “solo queue,” which is like an athlete going to the gym. They have a team lunch, play a couple more hours, have a coaching session followed by a team dinner. And yes, there are injuries, Blum said. Eyesight, carpal tunnel and wrist pain. Blum handles endorsement deals and helps players make separate income through subscribers who pay $5 a month to watch them practice. He opens an app on his phone called Twitch — a streaming service bought by Amazon for $970 million. We’re two of 25,000 people watching a League of Legends event at 9:30 a.m. on a Wednesday. Below us, the international crowd has cleared, presumably to Seattle Center to sit inside, in the dark, on a beautiful summer day and watch people play video games. “It’s entertaining, it’s fun to watch and it’s a learning experience,” Blum said. Information in this article, originally published August 16, 2015, was corrected August 16, 2015. A previous version of this story incorrectly stated the origin of the Evil Geniuses gaming team.